The Stand-alone licenses tie a given software application to a single machine. This method of licensing requires a machine's unique identifier (SID) to be incorporated in the license activation process. After buying the product, a generic license is sent to you. This license must be installed and activated before you can use the software. In the activation process the license is linked to the hardware. As soon as your order is authorized, we will send to you an e-mail with the license code and links to download the software. On this page, we explain how to install and activate a Stand-alone license. Obtain the License Code from the registration e-mail. Install the license during the software installation, or later using the License Manager tool. If the entered code is valid, press Ok. The license is installed on your computer and you can continue with the installation process. 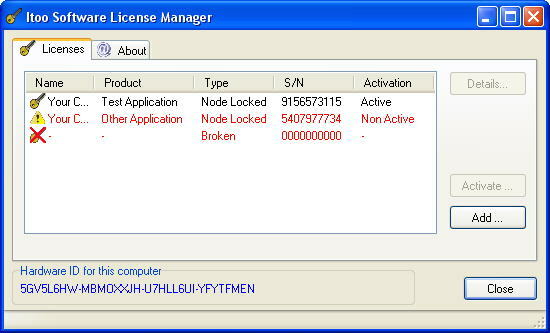 You can also review and activate the license later, using the License Manager tool. If you have an Internet connection, you can activate your software online. The License Manager will connect with our activation server through a secure connection, and the activation codes are sent and installed in one step. Select "Activate Online" as the activation method. Check that the license data is correct and press "Proceed" to start the activation process. The software connects to our Activation Server through a secure connection (no personal information is sent during the process). After few seconds your license will be activated, and your software will be ready to use. If you have trouble with the on-line activation, or the computer where your are using the license does not have Internet access, you can use Manual activation. Select "Activate Manually" as the activation method. Open a link to our Activation Web page and enter the codes given by the dialog. Following the steps indicated in the page, you'll be given an Activation Code, enter this code in the dialog box when requested to activate your license. In either case, if you have trouble during the activation, you may contact us at activate@itoosoft.com. When you install any Itoo Software commercial product, the installer also includes the Itoo Software License Manager. This tool is used to manage the licenses of your purchased software. Activated Stand-alone licenses: Shown in black text, these licenses are ready to be used. Un activated licenses: Red text with a warning icon, these licenses are valid but have not yet been activated. You must activate them before using. Broken licenses: Red text with an error icon . These licenses have corrupted data and can't be used in any form. You must reinstall them. For more information about a license, you can click on the "Details..." button, where you can see the data stored in the license. If you have not installed a license with the software installation process, use the "Add.." button in the licenses tab. The installation process is the same as the one described above for the installer. When a new license is installed, you're asked to activate it. In this process the license is linked to your hardware. The activation process is the same as the one described above for the installer.